At this time of the year we should expect the Antarctic sea ice to be growing rapidly, but after the historic lows of last Antarctic summer, we can see that whilst it is rapidly advancing, the sea ice extent (the area of ocean covered by >15% of sea ice) it is still ~1 ¼ million km2 below the median from 1981-2010. 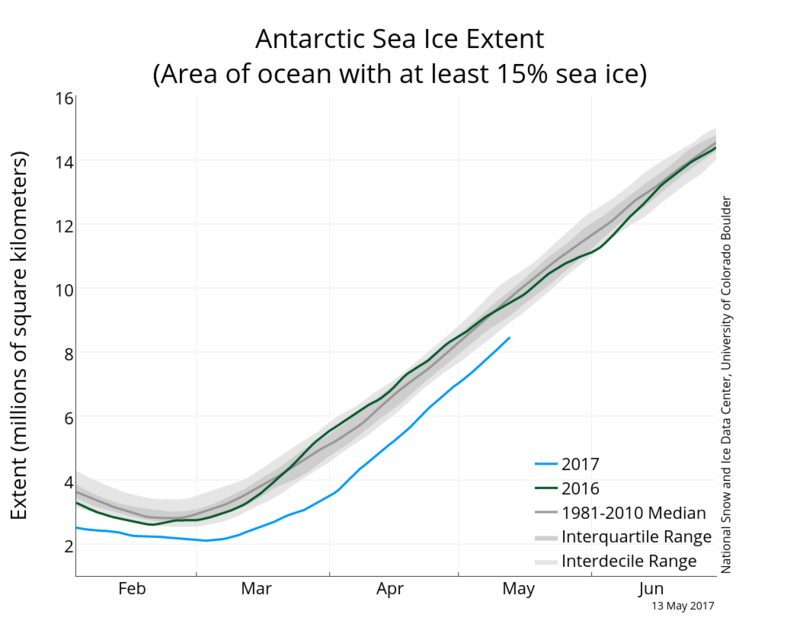 Antarctic sea ice extent (with greater >15% sea ice cover) 13 May 2017. From NSIDC. There is not a consistent trend in Antarctic sea ice extent, and much regional interannual variability. The plot below shows the sea ice extent on 13 May for each of the years 1989-95, and 13 May 2017. Antarctic sea ice extent on 13 May for the years 1989, 1990, 1991, 1992, 1993, 1994, 1995 and 2017. Data from DMSP SMMI. The image above shows the sort of variability we expect in the Antarctic sea ice extent. It is helpful too to see where the sea is currently is and isn't compared with the mean from 1989-93. The mean Antarctic sea ice for the years 1989-93 on 13 May, the sea ice concentration on 13 May 2017 and the difference between the two data sets. Blue shades imply more sea ice and reds imply decreased sea ice compared with the mean. The original data come from the DMSP SMMI data set at the NSIDC. The regions in May 2017 with the greatest deficit of sea ice remain the Amundsen and Ross Sea, and the Eastern Weddell Sea and off the coast of Dronning Maud land. As I said in my last Antarctic sea ice post it is likely the freeze up is delayed because of the heat gained by the ocean in the Antarctic summer of 2016/17. 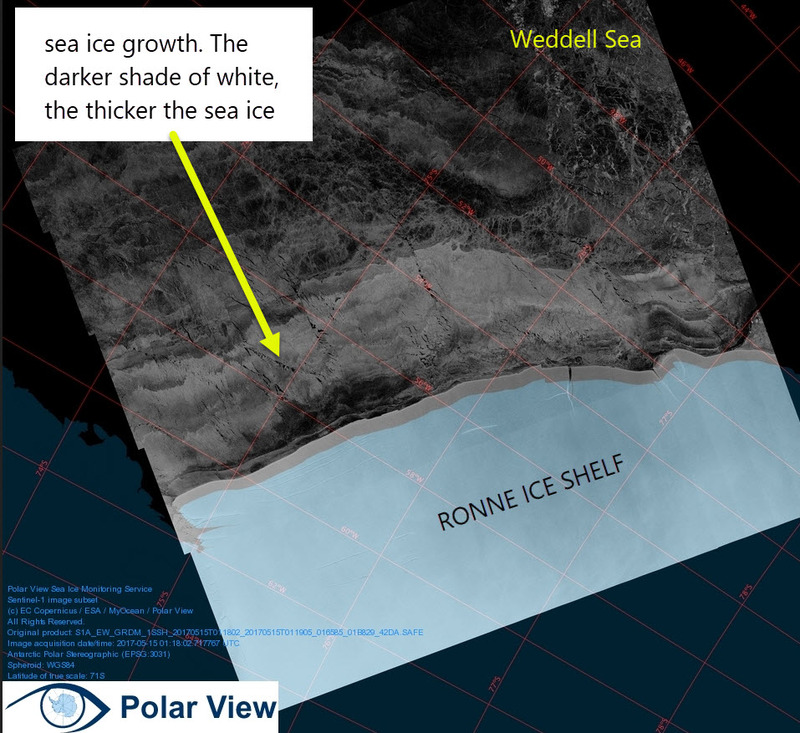 You can also see in the South West Weddell Sea the Ronne Polynya I wrote about in March 2017 is still seen in the sea ice concentration data. In the visible satellite data you can also see this open water. 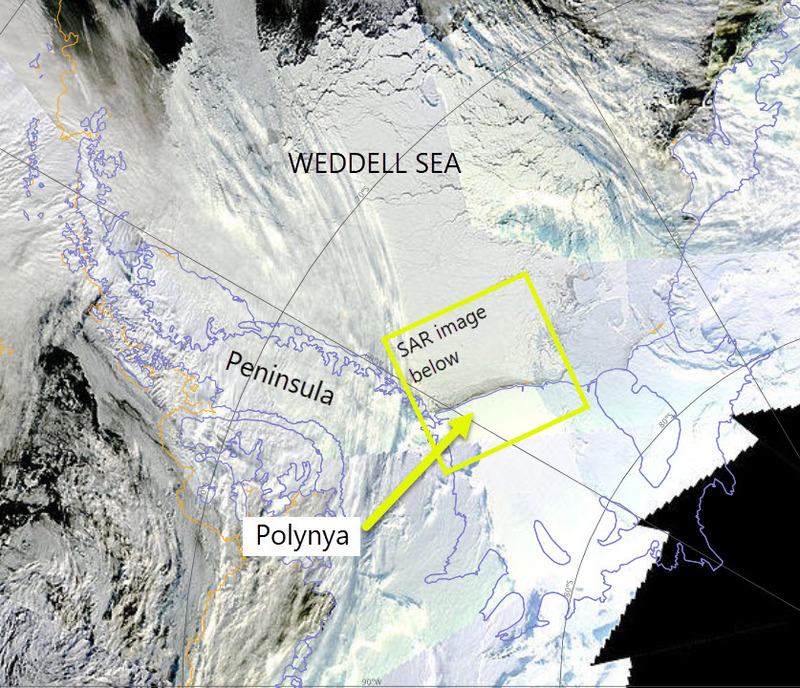 The Ronne Polynya can see seen in the South West Weddell Sea satellite data on 15 May 2017. The box marks the approximate image of the SAR image below. In the Sentinel 1 SAR data from the 15 May (From PolarView), the growth of the sea ice in the polynya is clear. Sentinel 1 Synthetic Aperture Radar (SAR) Image 15 May 2017 in the South West Weddell Sea. From PolarView. This ice growth is important for the ocean as it means the salinity of the waters just beneath the sea ice will be increasing. I'll keep watching the polynya to see if and when it closes up. And I will also keep looking at the sea ice. Posted in Science. Tags: antarctica, Ronne Polynya, SAR, sea ice extent, Sentinel 1 on May 15, 2017 by Mark Brandon.